"The Grid is like the 'skeleton' of the body's energy system. It is the foundation on which all of the other energy system sit. It is your most "solid" or most dense energy." When a Grid goes "out" - usually in response to trauma or shock- the very core of the body's energy system is thrown off, and this has ramifications throughout the mind, body, and spirit. Usually a person's other energy systems will adapt to a Grid whose structure was damaged during childhood, so the person may be unaware of the damage. But this will generally limit the person in some way having to do with vitality and mental acuity or make the person more vulnerable to illness and less adaptive to environmental challenges. Nonetheless, a person can go through an entire lifetime without ever knowing the Grid has been damaged. It is a very deep structure. The decision to do Grid work is to invite the changes at many levels. Your energies have adapted to a deep if imperfect structure, and now you are undergoing an intervention that shifts that structure. Other energy systems may subsequently need to adapt as well. It is not possible to predict which systems will adapt or how this will be experienced. To minimize any disruption in your life, Grid work is not conducted until the other energy systems are stable, resilient, and integrated. This supports the body's energies to adapt more readily after the Grid has been realigned. Grid work is never a first step in Donna Eden's system of Energy Medicine. The basic grid is the foundation or infrastructure of the other energy systems, like the frame of a building or the bedrock of a river. 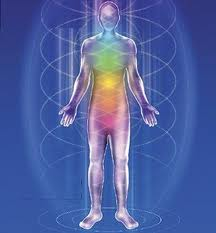 It has the appearance to those who see energy as a graph of energy lines over which the chakras are situated. If the Grid is impaired, all the other energy systems in the body become compromised, less organized, less able to adapt, less grounded. Physical, emotional or spiritual trauma can pull the Grid apart, affecting the energetic health of the whole person. Repairing the Grid reestablishes this core energy, which then has a positive, corrective influence on all the other energy systems. In situations where the Grid is badly damaged, the benefits of other energy interventions may not be sustaining until the Grid has been repaired. Regression is the process of energetically and psychologically returning to the time and place where core issues in our present lives became established. This may involve loss, betrayal, illness, injury, or other forms of trauma. When we have intractable physical, emotional, energetic difficulties that seem to have no clear physical cause-and-effect relationships, doing a Regression session can illuminate how and when these patterns were created in the energetic field of an earlier time. Sometimes a Regression session will bring the person to the time that the Grid was damaged and lead to Grid work. Conversely, Grid work can often bring a person back to an earlier period and may lead to a Regression session. As with any intervention that actively moves energies in a person's body, there is the possibility that intense emotions or physical sensations may be activated. Please be assured that this generally is a normal and theraputic part of the healing process. Your Energy Medicine practitioner will give you further instructions as the process unfolds. How long a Grid takes to connect also cannot be predicted, so the session's length can vary from person to person and for each Grid session. This means that neither the client nor the practitioner should have any limiting time constraints for the appointment. Generally a Grid session is at least 90 minutes and may be much longer. If several Gris are "out," each Grid is adressed in an individual session and in its own timeframe between the Grid sessions. It is important to maintain regular energy sessions in preperation for and after Grid sessions. This former point cannot be emphasized enough in order to insure a smooth integration of the energy work. Grid work or preparation for Grid work sometimes includes "Regression sessions" where the root of a health challenge are addressed by exploring the circumstances that led to the health challenge. Sometimes a session that was scheduled as a Grid session transforms itself into a Regression session, and sometimes a session that was scheduled as a Regressionsession transforms itself into a Grid session. This is a natural, organic process and the flow and direction of the work should be respected, even if unexpected. Regression work, when it occurs, will often bring into focus an incident from earlier in your life. At other times, there is a sense of being in a situation that is not familiar and might even seem like you are experiencing something that happened to another person. Some people interpret such experiences as their having tuned into a "past life," and the theme they experience often has relevance to their current health challenge. Others interpret it more like a dream where their experience is a metaphor for something relevant to their current life circumstances. Neither Grid or Regression Work is intended to replace conventional medicine or psychotherapy, but rather to compliment sound health and mental health practices. Before scheduling Grid work, you and your practitioner should discuss any medical or psychotherapeutic treatments you are receiving and, if either of you feel it is advisable, should consult with those providing that care. If preexisting symtoms persist, or an ailment is severe, please immediately consult your Energy Medicine practitioner as well as your physician or therapist as appropriate.